I am so happy to see this collection. All glitter. All of it! GLITTER!!! And thankfully I had a little sunlight to capture the sparkle. My pictures don't totally capture the iridescent, glittery, fish-scaly sparkliness of these, so please just use them as an approximation. Alegra. For some reason, this color kept messing up my camera! It's not quite so red, it's more of a bright magenta. Bright magenta jelly-ish base with a mixture of pink iridescent and clear/white 'fish scale' like iridescent flecks. Bright... richly colored... SPARKLY. This is a pink I can wear. Charla. A mermaid in a bottle? This is a blue-turquoise sheer base with tons of silvery, golden, blue-ish, greenish iridescent glitter. This is more traditional glitter- circular metallic particles. Lots of pretty green/blue/gold duochrome that didn't quite come through in this picture. You can see some of the turquoise/green flip and the gold flecks in the left side of the picture, though. Better in real life. Gilda. Another pink I would totally wear! It's not as deep/dark as it seems in this picture (I think it's my pasty white fingers throwing the color off LOL) but it is a bright, cheerful, girly hot pink with the iridescent 'fish scale' type shimmer like Alegra has. It's not as bright as Kiki. It is definitely loud, though. Kinda 80's awesome. Ivanka. Is this the color of money for a reason? Heh. But seriously, this is awesome. It's mainly green with a little bit of a blue duochrome and lots of golden speckles. Another mermaid-type polish. It's GREEN. Enough said. Mimi. Okay, you know the drill. It's purple. Picture it being less blue-toned and more red-toned. To give you an idea of how this looks in real life, it's not bright like Nubar Violet Sparkle but it is a lot like Milani Totally Cool but with less duochrome. That being said, Totally Cool was probably my favorite drugstore release last year so of course I'm going to adore this. It's purple. It's glitter. It's iridescent. It's basically screaming my name! Nidhi. This is interesting. It's a variation on the red/glitter combo, but it's UNIQUE! I'm pleased. It's a light, warm red creme base with gold microglitter and little silvery iridescent flecks. This is the most opaque shade of the collection. Very dense base. Exotic looking, like gold jewelery with red stones. The formula on these was great. No problems. Some of the shades are slightly sheer while others are completely opaque in two coats. I did three coats of all just for my own sanity. Three coats looks pretty great with all of these, too. Deepens the colors. Dry time was very fast, faster than the average Zoya polish. Removal was super easy. The glitter in these is really small so it doesn't take much effort to remove. The only downside I experienced was that Charla gave me major smurf-fingers when removed. It took a little extra remover and a hand-washing or two to fix, nothing permanent. Overall, AWESOME!!! GLITTER!!!! It's like Zoya has been spying on all of us and seeing how excited we get about colorful glitters. I love seeing glitters in bold, vibrant colors. These definitely fit the bill for bold and vibrant! And they're uber-sparkly. I'd even say they're more sparkly than the winter Ultra-Glitters. I'm a happy camper. I'm actually feeling a little spoiled with the massive amount of awesome glitters coming out lately. Won't hear me complaining about that! This is only part one of the Zoya Summer collection. Part two is the Flash collection- six colorful cremes. I'll have that review up as soon as I'm done editing the pictures. Scrangie it is great to see swatches once again =P and with such an outstanding collection too... I'm happy! I think I am going to have to pick up the mayority of these, although I am not much of a glitter fan. Are they a PAIN to remove as is regular glitter? Thanks so much for the swatches, Scrangie!! I am absolutely in love with Charla - it is stunning (and terming it "a mermaid in a bottle" describes it perfectly). Gilda and Mimi have just been added to my wishlist. Loving all the glitter. Gorgeous! Wonderful swatches as always, thanks so much! Nice glitters. Om nom nom nom. These are so pretty, I'm especially drooling over Charla and Mimi. I need these. (Well, all but the last, it's a little too warm toned for my skin.) But I NEED these. They look like summer! Love these glitters! 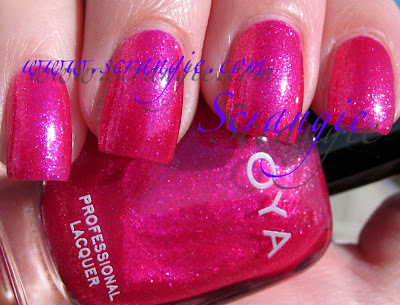 Zoya never fails to amaze us! Wow. I'm not a glitter fan, I don't usually like warm coloured polishes but I think I will be purchasing all of these except Gilda. Alegra, Charla and Mimi need to come home to me. Can't wait to see! Great job on these.. I'm loving Charla. The 'mermaid' description is perfect for it. I WANT THEM ALL!!!!!! These look so amazing. I will gladly pay a fortune to get these sent over to New Zealand! The colors together with the glitters look yummy! I need them, neeeed them! Great review, how was the texture on these glitters? smooth? or rough? These are so FREAKIN cooollllllllll!!!!!!!!! I have a stalker-ly obsession with Zoya already and it totally just got a lot worse! Wooooo! I need to get my hands on the blue and green ones! Even though Charla left you with Smurf fingers, I think it's worth it! Thanks for the pretty swatches, Scrangie! Great swatches! I enjoy reading your posts! Gilda, Mimi and Nidhi have been added to my "wants" list. I love glitter and sparkle. "It's (Mimi) basically screaming my name!" No it's RBL's Scrangie that's screaming your name and it seem it has not fallen on deaf ears. Congratulation on 2 sellouts of Scrangie and Hooray for it's return to the RBL line-up! Going by the preview I thought I was only going to want Ivanka and Charla, but after this I want them all. :P Thanks for the swatches!